This is your world, folks. Deal with it. Using a cute rabbit or a kangaroo to sell wine is old news. Last week I mentioned wines with Hitler on the label; this week comes news of a wine importer going in a completely opposite direction -- it has Jesus on the label. The Grapes of Galilee is a new Israeli wine label aimed at American Christians. The grapes are grown in the region where Jesus Christ is said to have lived, and they are irrigated with water from the Jordan River, where he was baptized. Wine from Israel is nothing new, but most of the Israeli wine sold in the U.S. has previously been to Jewish consumers. 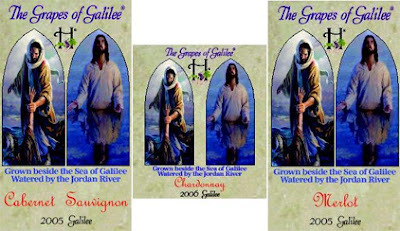 In fact, the Grapes of Galilee wine comes from an existing Israeli winery, only the Jesus-themed label is new. As Ad Age reports, the importer, Pini Haroz, sees the chardonnay, merlot and cabernet sauvignon wines as being perfect for holidays and he is marketing it in areas with high concentrations of Catholics. The wine sells for $13.99 a bottle online. This reminds me of the "water into wine" incident, also known as "the miracle at Cana", sometimes said to be Jesus's first public demonstration of his paranormal powers. When I lived in a group house as a student, we used a large wine bottle as a water carafe on the table, saying it represented the miracle of "wine into water." Ah, but was it all parlor tricks? I wasn't there so can't say. Well, we do like our labels and theme parties, and this label would go nicely with the images found on many a devotional candle and other holiday esoterica, in a way that, say, a bottle of Mad Dog 20/20 might not. And surely J.C. is a brand in the public domain. No denomination owns copyright privileges that I know of (though many might feel they do.) If one is crass enough to plunk $13.50 down on it, along with their tabloid news of Brangelina, I say, they should have it. Ain't that America?! Nothing wrong with Mad Dog. Hahaha.